So I am now the proud new owner of a tart pan. This of course means that there will be a large number of tart posts in the near future as it’s something new and unexplored. I’ve only really been exploring baking for the past 6 months or so, and as I’m sure you’ve experienced, there is a pan for everything. Meaning there is always a pan you want need. Luckily my very kind husband is understanding and very encouraging, and I know all the right places to look to find a decent deal. And all of this led to my new pan, and a whole list of must-make-soon tarts. This one in particular was a hit—especially a la mode. 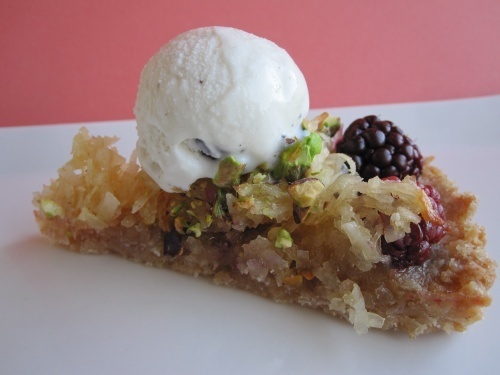 It’s perfect for those with a sweet tooth, and the blackberries and pistachios lure in the rest (those people who ordinarily would “no thanks, I’m on a diet” me when I offer them a slice). 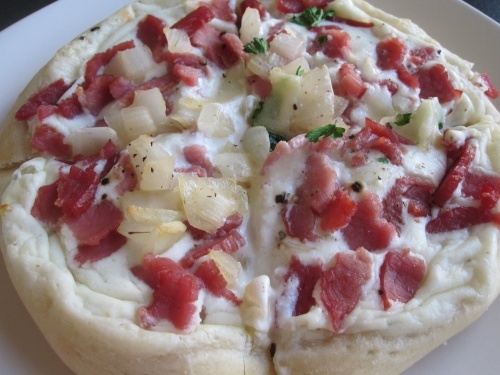 And this recipe is from scratch–the most simple homemade recipe I have ever made. Really. This meal was especially chosen so that I could try an ingredient I had been meaning to get around to–bulgur. I read about it in Real Simple’s list of the 30 healthiest foods along with quinoa, and once I had made the latter I was hooked and couldn’t think to deviate from this new wonder food. Bulgur boasts a long list of good-for-you qualities, including more fiber than brown rice, calcium, potassium, and B vitamins. I thought, why not give it a try? And this recipe is an all in one, pile it all together and bake it kind of recipe, which makes me love it even more. 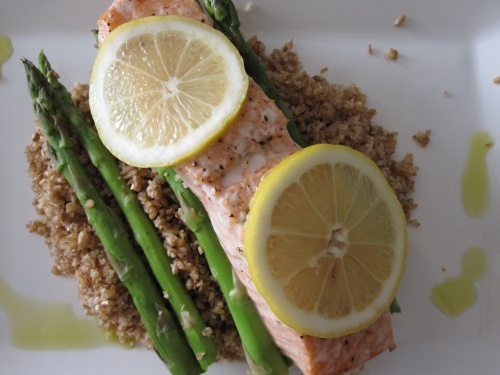 Its simplicity and healthfulness make it a great, light dinner for the start of summer. 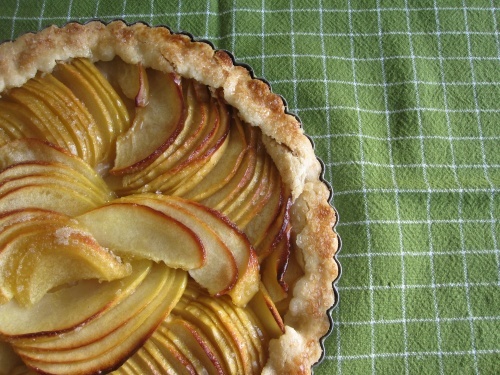 One look at this tart and I’m betting that you are thinking the same thing I did—I must make that. In this recipe’s case, a picture does say a thousand words. Apples, butter, and sugar. It’s beautiful and simple, a no frills kind of dessert. Though I wouldn’t turn away a healthy sized scoop of vanilla ice cream if it came your way. Hi-hats. They are a cupcake that I think most with an affinity for sweets lay their eyes upon with both awe and fear. When I decided to make these for a family Easter gathering, I mentally prepared for a night of melting down (pardon the pun) and do-overs as many delicacies involving chocolate have seemed to lead me to. But fear not! They were surprisingly simple, as long as you have gotten past the stage of burning through 2 bags of chocolate for every one well melted batch. They are far worth the effort, and though these tall towers make it hard to decide where to take the first bite, trust me when I say that people will figure it out. My husband works with a group of men who have graciously taken on the part time job of taste-testers and sweet-eaters. They also love their coffee, so when I got a request for a chocolate coffee cupcake combo via a cut out magazine picture of one that got passed from hand to hand until it reached me, I wanted to do it right. 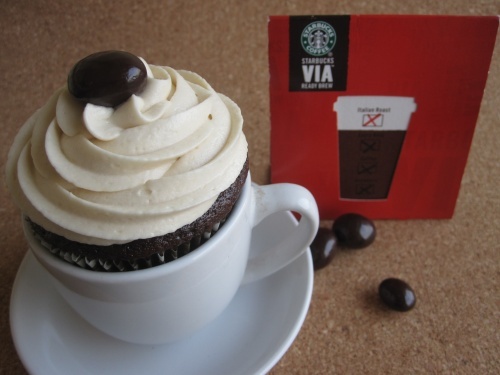 I had Starbucks Via Italian roast (a bold flavor) I had been keeping around for such an occasion as I always see reviews for coffee cupcakes followed by comments about how the coffee taste could have been stronger. 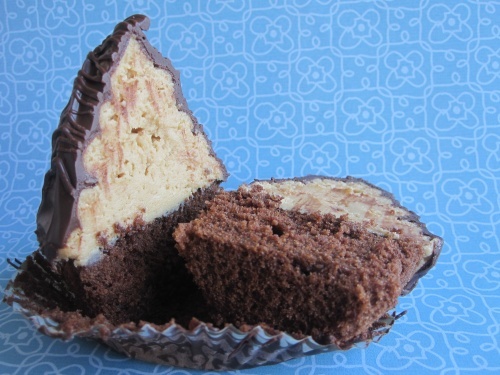 This recipe has coffee in both the cupcake and the icing, and I opted for dark chocolate covered espresso beans to top them off which we found if you ate first–which almost everyone does because how can you not–left a lingering coffee taste that adds to the overall flavor of the cupcake.